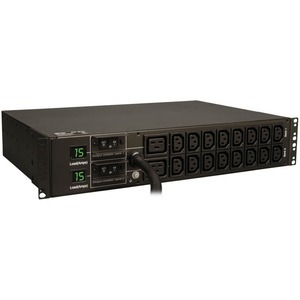 PDUMH30HV horizontal 2U metered rack PDU supports 30A maximum capacity at 208/240V (agency derated to 24A continuous). Includes 12 ft / 3.6m attached line cord with L6-30P input plug and 18 output receptacles (16 C13, 2 C19). Outlets are arranged in two separately breakered 9 outlet load banks. Set of two visual current meters tracks the output current of each load bank separately.